Health chiefs are “optimistic” that a helipad for air ambulances can be included in plans for a new hospital on Skye. Air ambulance services at the Dr Mackinnon Memorial Hospital in Broadford were stopped three years ago due to safety concerns. The service moved almost 5 miles away to the Ashaig Airstrip but concerns have been raised that the hospital’s own helipad may not be replaced. The Scottish Air Ambulance Service (Saas) and NHS Highland have now said they are seeking a “long term solution”. A new hospital is to be built at Broadford as part of a shake-up of services which has sparked protests from campaigners who believe the facility should be located in Portree. 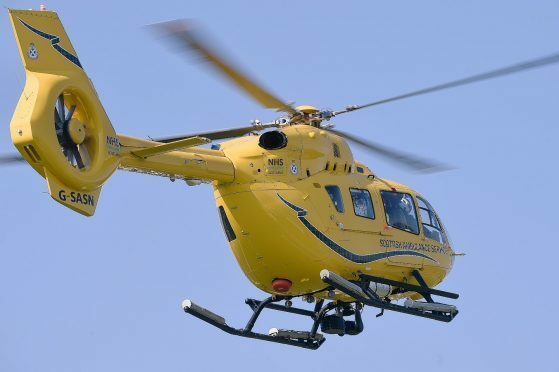 As part of the project, health chiefs have revealed that they will bid for cash from the County Air Ambulance Trust’s Helicopter Emergency Landing Pad appeal to reinstate the helipad at the new hospital. Eric Green, head of estates at NHS Highland, said: “Discussions are progressing well, and I am optimistic that we will be able to find a suitable site and secure funding. In October 2014 a report by Babcock International Group, the operators of the air ambulance service, identified safety concerns around helicopter operation from the existing helipad at the hospital. Andy Moir, head of air ambulance, said: “On the strength of this report, air ambulance services were discontinued and Scottish Ambulance Service (SAS) and Babcock have, instead, been using Ashaig Airstrip which is 4.5 miles away. “This requires a site preparation, including the setting out of portable landing lights for night operations and a road transfer by ambulance to the hospital. Skye councillor Ronald MacDonald, who campaigned for the new hospital to be built in Portree, said: “The existence of a helipad facility is clearly vitally important to an area such as Skye, Lochalsh and South West Ross.